UP2U is a new two person workstation that caters for individual height adjustment on a shared frame. The height of the workstation can be adjusted by the user in seconds via a crank handle. The range of adjustment is from 660mm to 960mm. When UP2U is linked together, the recessed leg frames allow the two man workstations to become a true benching solution. Worktable desking and benching is an elegant office space management solution that takes value engineering to a new level without compromising on build quality or structural stability. Available with fixed or sliding worksurfaces and a cable management facility that effortlessly accommodates even the most demanding IT requirements, Worktable delivers a functional solution in real style. IN4M desking features an elegant “A” leg that offers simple height adjustment from 680mm to 860mm via a height settable foot. IN4M is a responsive product and perfect for office churn; it is simple and quick to build and all components are totally non-handed. SIT-STAND desking provides the user with the flexibility needed to change the posture from sitting to standing and all dynamic postures in between with a touch of a button. Sit stand desks are ideal for the agile working environment. Samuel Bruce manufactures a sit-stand desking system with two ranges: 700mm to 1150mm and 650mm to 1250mm. IN5 is a benching and desking solution that offers two distinctive leg styles. IN5 is a robust solution with cable management features that can be graded to suit a client’s exacting needs. IN5 has been a tried and tested Samuel Bruce solution for many years and has successfully secured many large projects across the UK. C2 is a new telescopic beam system that will accommodate any width top from 800mm to 2200mm. The cantilever leg frame is non- handed and legs can be shared to reduce cost and to provide an uncluttered visual aesthetic. The ability to specify the leg foot and upright section in contrasting colour ways enables C2 to make a real statement at a sensible price. C1 is our entry level product but quality is not compromised. 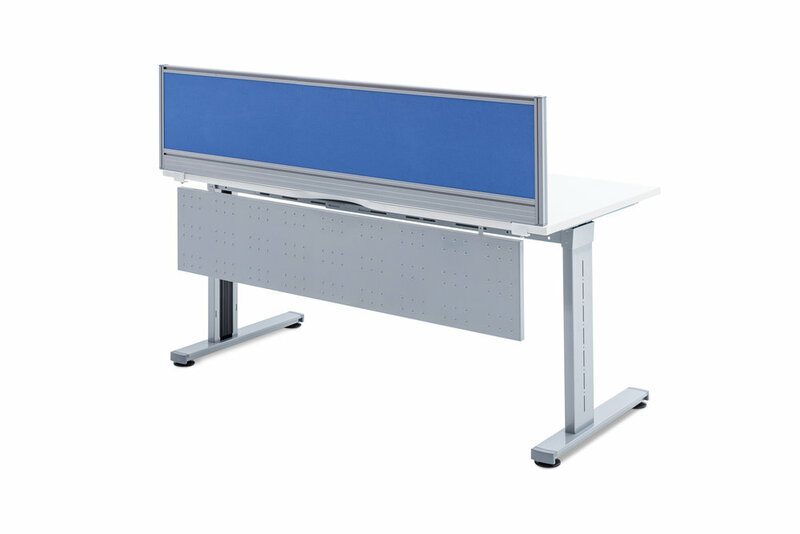 Manufactured in exactly the same raw materials as all other Samuel Bruce products C1 offers our clients a robust desking solution with non handed leg frames at very low prices. As with all of our other products C1 is available in a wide range of standard finishes, shapes and size options. PINO is a panel sided desking, benching and table system that offers our clients a wide range of standard products in many different finishes, shapes and sizes whilst retaining a more traditional style. What sets PINO apart is the seemingly limitless array of bespoke solutions that it can provide. With no restricting metal sub frame PINO can be used for a wide range of applications – Reception desks, Nurse Stations, Student Accommodation furniture, Oil rig cabins even beds! PINO was our first in house manufactured product range launched over 15 years ago – it’s still going strong, it’s still relevant and as ever, very affordable. All of our desk and bench solutions incorporate a wide and varied range of steel or wooden personal storage units, pedestals, caddies and Tower units and a broad portfolio of desk accessories. With desk top power and data modules, CPU Holders, flat screen monitor arms and task lights a desk can be transformed into a true workstation that meets the users exacting needs. We pride ourselves on listening. Understanding our client’s needs and responding with product solutions that meet their exacting criteria is what we do best. The ability and willingness to provide tailored solutions for our clients makes us different in a market saturated with product. Unlike most manufacturers we offer a large range of shapes and sizes across our desking and benching systems – all as standard. The added benefit of being able to produce bespoke desking, table and storage solutions ensures that a solution is always available from Samuel Bruce. Rectangular, Square, Double Wave, Single Wave, Wedge, Combi, Delta, Bow front and Oval. This is the heritage of the Samuel Bruce factory. Long before office furniture was first produced the Dundee factory specialised in the manufacture of bespoke, fitted Oil Rig cabin furniture including bunk beds, wardrobes, lockers and cabinets. Samuel Bruce continues to be recognised as a specialist accommodation furniture solutions manufacturer to this day. Samuel Bruce offers 12 standard finishes that can be mixed and matched in many ways. We also provide a wide range of alternative special colours and special finishes that can help in creating vibrant and unique working environments.